Water potential is the potential energy of water in a system compared to pure water, when both temperature and pressure are kept the same. It can also be described as a measure of how freely water molecules can move in a particular environment or system. It is measured in kilopascals (kPa) and is represented by the Greek letter Psi (Ψ). Water potential is never positive but has a maximum value of zero, which is that of pure water at atmospheric pressure. When it comes to impure water, or water that has solutes in it, the more solute there is, the more negative Ψ becomes, since the solute molecules will attract the water molecules and restrict their freedom to move. 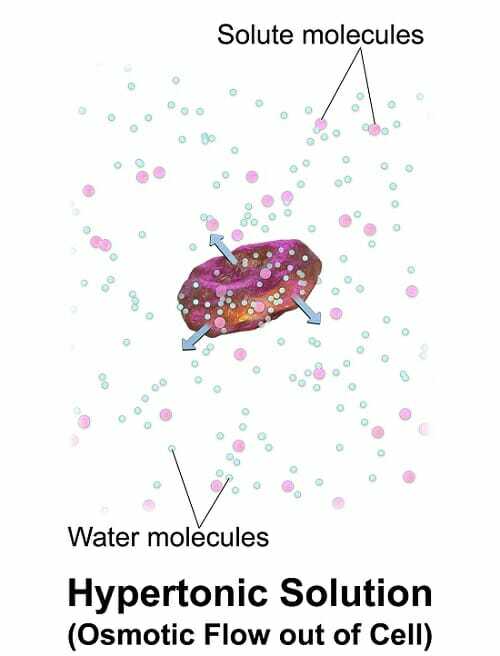 Water moves from areas of where water potential is higher (or less negative), to areas where it is lower (or more negative), and we refer to this movement as osmosis. For example, in the diagram below, the solution around the cell is hypertonic, meaning that it has a higher concentration of solute, so a lower water potential, than the inside of the cell. Since the cell has a partially-permeable membrane, allowing the movement of water in and out of it, water will move from inside of the cell, where Ψ is higher, to outside of the cell, where Ψ is lower. This can lead to the death of cells in living organisms. On the other hand, a cell that is placed in a pure water solution could take up water until it bursts and dies. Therefore, cells need an environment that does not differ significantly in its solute concentrations. Water potential is what allows water to get into plant roots when there is more solute within the root cells than the water in the soil. And as we go up the plant, Ψ decreases more and more, drawing water into the stems and then the leaves, which constantly get water evaporated out of them, maintaining a high solute concentration and a low Ψ. In our bodies, solute concentration is regulated through osmoregulation, which controls and maintains water and salt concentrations to keep us alive. Here, Ψs stands for solute potential, Ψp for pressure potential, Ψg for gravitational potential, and Ψm for the matric potential. The pressure potential refers to the physical pressure exerted by objects or cell membranes on water molecules, and it increases with increasing pressure. Note that pressure potential is usually maintained at a positive in plant cells in order for them to hold their shape, allowing the plant to stay rigid. In addition, matric potential takes into account forces between water molecules and surfaces or substances, such as soil or cell membranes. The matric potential is always negative and is more significant in dry systems, such as soils, because we find that the water particles are strongly attached to the soil particles. As the name implies, gravitational potential is the way earth’s gravity influences the freedom of water molecules to move. Finally, solute potential depends on the amount of solute in a solution, and it decreases as the concentration of solute increases. Diffusion – The arbitrary spreading of particles from a region where they are at a higher concentration to another where they are at a lower concentration. Hypotonic solution – A solution with a higher solute concentration in comparison to another solution. Isotonic solution – A solution with an equal solute concentration to another solution’s. Viscosity – The extent to which a fluid resists flow. 1. What can we expect to observe if we place a cell inside a solution where the cell’s Ψ is equal to -0.3 kPa and that of the solution is -0.9 kPa? A is correct. Water moves from an area where water potential is higher, to an area where it is lower. This means that it would move from the cell to the solution outside. C is correct. The simple formula we use is Ψ=solute potential (Ψs)+pressure potential (Ψp). 3. Which of the following values of water potential indicates the driest environment? D is correct. The drier the environment, the more solute there is, and therefore the more negative the value of Ψ we get. 4. How does water potential vary in relation to solute concentration? B is correct. The higher the concentration of solute, the less free the water molecules are to move, and the lower is Ψ.